Two phenomena that have been haunting humanity for a long time are Noah’s Ark and the Great Pyramid of Giza. It has however rarely been suggested that these two are connected. One, the Ark, is part of the Biblical Flood Story and would by many be considered as merely mythological. The other, the Great Pyramid is probably the most impressive megalith on our planet, whose existence no one doubts. In this article I will argue that the Ark and the Great Pyramid are connected through the consciousness shifts, which gave rise to human civilization and history. To demonstrate this connection, I will base myself on the Mayan calendar but also on an interesting recent translation of a Dead Sea Scrolls pertaining to the Ark. The idea that the rise of human civilization was caused by a shift in consciousness in the global mind is a central idea in my most recent book The Global Mind and the Rise of Civilization (Inner Traditions, 2016). This idea differs in significant regards from the other two chief ideas (outside of the mainstream) that seek to explain the rise of civilization, that is to say, Ancient Aliens and Atlantis. The ancient alien idea is that humans on this planet began to create civilizations at the instigation of extraterrestrials, who visited from distant stars and galaxies and shared their knowledge. The Atlantis, or “lost civilization” idea on the other hand is that there must have been a “lost” civilization much older than those we actually know of and that survivors from this civilization helped spawn the ones in Egypt, Mesopotamia and the Indus Valley that emerged about 5,000 years ago. The third alternative – the one that I propose – is that civilizations arose on our planet because of precisely timed shifts in consciousness early on. This would immediately explain why the rise of civilization seems to have been such a sudden event with so few preceding forms. Egypt, for instance seems to have gone from the Stone Age to a sophisticated monarchy capable of erecting pyramids within the time span of only a few generations. If there was a collective consciousness shift, there would however be no reason to assume that this evolution would have to be a result of a slow and gradual process of learning. In my view, the most significant such shift took place as the global mind was activated at the beginning of the Mayan Long Count (or Sixth Wave) in 3115 BCE. As a result of this, the people in resonance with this global mind became endowed with the capabilities of creating civilizations. The Mayan calendar is based on different time periods characterized by different spiritual qualities and when we go from one of these periods to another, a shift in consciousness takes place. Up until the year 2011 the Long Count wave consisted of thirteen so-called baktuns (time periods of 144,000 days or 394.3 common years), which shifted between seven peaks (or days) and six valleys (or nights). We can learn about historical events from the different consciousness shifts generated by this wave and especially from its very starting point. This Long Count was the calendar that the Maya used for dating all of their own pyramids and so it was very significant to them. I will argue that we have reasons to assume that its beginning in 3115 BC did mean a significant shift in consciousness and that the Maya had something to say about what this meant to the humans. Hence, the most pertinent inscription about this beginning is probably the one at the Tablet of the Cross in Palenque, which states that at the beginning of the Long Count: “the First Father erected the World Tree” so that “the light could enter.” “It was made proper, the Raised-up Sky-Place, the Eight-House-Partition, is its holy name, the House in the North .” From this, the beginning of the Mayan Long Count seems to have meant a metaphysical shift on a global scale brought about by the First Father (what we would call God), who erected the World Tree (what most cultures refer to as the Tree of Life) in the North. At first this may sound cryptic, but not so if you place it in the context of Mayan and Aztec cosmology in which the world is often portrayed as an eight-partitioned cosmogram with the Tree of Life at its center (see Figure 1). What I believe the Maya in Palenque then were saying was that in 3115 BCE a global grid of eight directions was activated emanating from the North Pole (the Tree of Life). As human beings were in resonance with this Tree of Life and the eight partitioning this created, they were totally transformed by this and compelled to create civilizations. The activation of a grid of straight and perpendicular lines amounted to a very profound shift in consciousness, which for the first time endowing humans with a structured and rational, or if you like compartmentalized, mind, which allowed them to create civilizations. Assuming that humans create their cultures and societies according to the principle of ‘As Inside – So Outside’ this would mean that a rather short time after such a consciousness shift has taken place, we would start to find straight and perpendicular lines in the archeological record. We would in other words expect that people would then start to project their new structured mind (created by resonance with a global grid of straight and perpendicular lines) onto their external reality. Before we go into this, it is of course relevant to ask whether it was already known that something happened around the time of 3115 BCE to indicate that a shift in consciousness would then have taken place. The listing in Figure 2 of a few “firsts” in human history indicates that this was indeed the case. While the exactness of some of these dates may be disputed and maybe moved a hundred years or so in either direction, it is equally indisputable that they show a very coherent picture. Hence, a number of phenomena associated with true civilizations with writing and city life for the first time emerged on our planet around the time of beginning of the Mayan Long Count. We may also note that civilizations then emerged simultaneously in several different locations. To me at least this is clearly consistent with the global change inferred at the inscription in Palenque. In The Global Mind I explain almost all of the phenomena (Figure 2) that came with the “package” of civilization circa 3200-3000 BCE as the results of the downloading of a new geometry for our holographic minds. But does the emergence of straight and perpendicular lines, as well as the “eight-partitioning” mentioned in the Mayan inscription also appear in the archeological record from this time? Was it for instance this shift in consciousness that led people to start building pyramids? 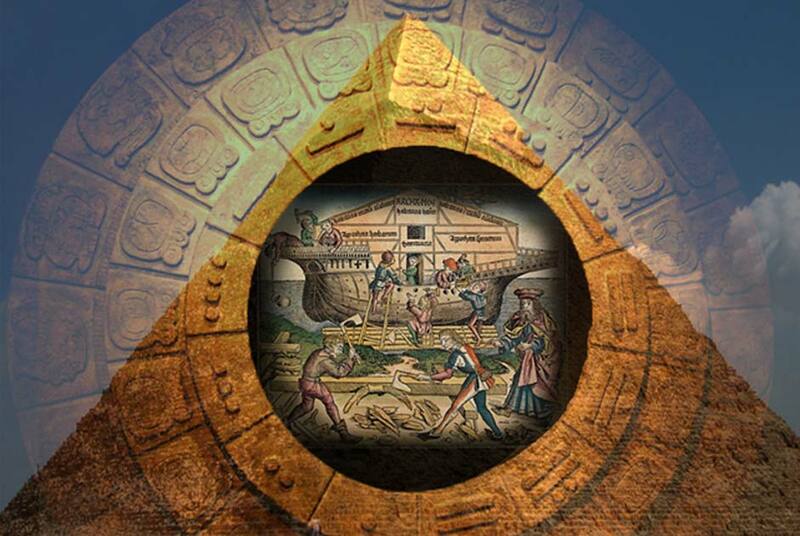 It seems plausible, since after all some of the pyramids are characterized by an astounding geometric precision. To help explore this we can in figure 3 see (solid lines) how the building of pyramids in the world is related to the Mayan Long Count. At least according to professional archeologists no pyramids were built before the beginning of the Mayan Long Count, but very notably around 3115 BC people started to build them in different parts of the world. We can also see in the figure (broken lines) that close to the pre-Long Count (the wave preceding the Long Count) people around 8000 BC in Göbekli Tepe and elsewhere had already started to build simple rectangular structures. This was still far from the precise straight lines that began with the Long Count proper, and was more like a “first time” at the beginning of the pre-Long Count. Top Image: The Great Pyramid, Giza, Egypt ( CC BY 2.0 ), Noah’s Ark illustration ( Public Domain ), and Mayan Calendar ( CC BY-NC-SA 2.0 ) Deriv. Noah as “mythology” is absurd. No, they are estimated to have been built about 500-600 years ago by the Inca. Especially Ollantaytambo is quite remarkable. So the Peruvian structures like Ollantaytambo and Sacsayhuaman, which feature rounded, pillowed stonework, are older than the 3115 download? I'm not disagreeing, just asking. Thank you, I am looking forward to hearing more from you when you have read my book. I just want to point out that when it comes to ancient monuments the Global Mind does not detemine some general concept of “advancement”. What we can see clearly is that with the Sixth Wave in 3115 BCE there is a jump in the sharpness of the geometry of the structures and in that respect one would be hard pressed to argue that Göbekli Tepe is comparable to the Egyptian pyramids. Thank you William and Carl for responded to my questions I had about the 10,000 year theory. I have made a list of the books and will be reading them to further my understanding.